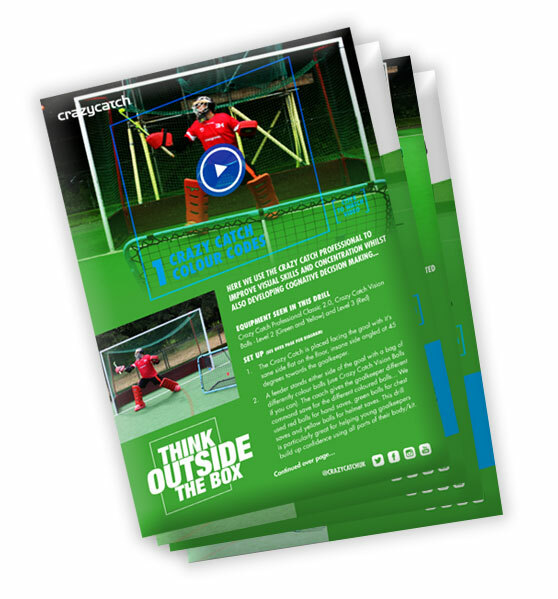 FOR ALL THE "THINK OUTSIDE THE BOX" DRILLS WITH DAVID HARTE, TWO TIMES FIH WORLD GOALKEEPER OF THE YEAR. THE MAIN BENEFIT OF USING CRAZY CATCH FOR HOCKEY IS THE VARIETY AND FUN IT CAN ADD TO YOUR TRAINING OR PRACTICE. USING BOTH THE SANE AND INSANE REBOUNDS IS A GREAT WAY TO FAST TRACK YOUR SKILL LEVELS AND SIMULATE MATCH CONDITIONS. PARTICULARLY WHEN PLAYING THE BALL IN THE AIR. “CRAZY CATCH PRODUCTS TRANSFORM ANY DRILL.